← Paris. Croissants. Art. Fashion. Nooooo. It’s our last night. I’m sitting in our apartment enjoying a wine from the hypermarche (supermarket) before we head across to our local wine bar/restaurant across the road. So close that our apartment’s wireless signal still works there. We have had a cultural two days. Mike and I immersed ourselves in art and architecture. We had already had a hedonistic day at the shops, so we purified ourselves with museums and galleries. And no, our credit cards haven’t been declined, although I’m sure it wouldn’t have been long – the Visa card was getting too hot to hold. We had the two-day pass to all the museums and galleries Paris had to offer, and it’s a long list. We elbowed our way past all the tour groups from every country around the world, to ‘ooo’ and ‘ahhh’ over the French’s excessive love of the arts. You get to understand the French psyche, when you learn what a high regard they hold for the arts. Australians could learn a few things from the French. But with all their holidays, smoke breaks and lunch breaks with wine, how does this country get anything done?! Now, I will not bore you with the list of galleries and monuments. I will say, however, that Mike, who normally groans every time I take him to a gallery, church, or crumbling old monument, was impressed and enthusiastic. Saint Chappelle, the gothic royal chapel with its four storey-high stained glass windows that literally wrapped around all four walls of the building, was breathtaking. 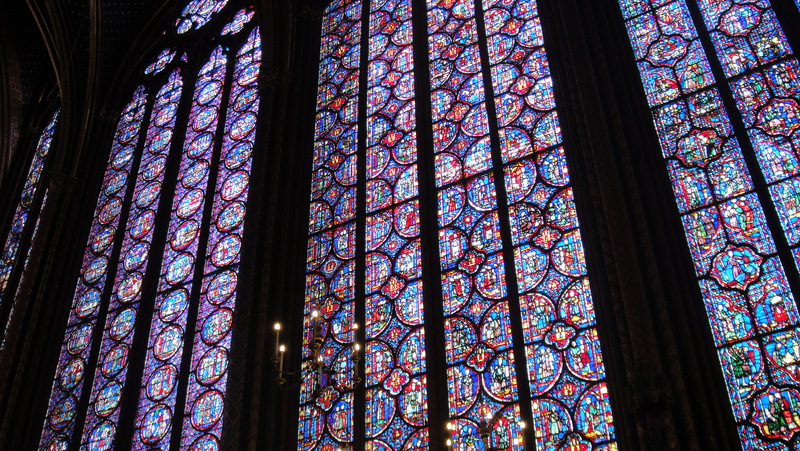 The Blood Red and Yves Klein Blue of the stained glass arched windows, reflected onto the chapel’s floor and the faces of hundreds of awe-inspired tourists … unfortunately, most of whom were busily taking photos that will never do it justice. We then visited the prison/dungeon that Marie Antoinette spent her last days in. Not a very cheery location. Hold on. I promised not to bore you. Suppose I lied, sorry. One last bit. Which is why I’m sitting exhausted on the couch. 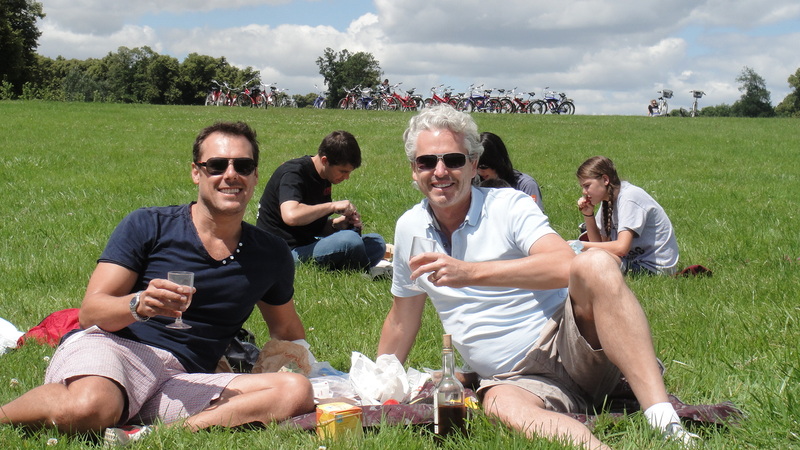 We did a cycling tour of the Palace of Versailles. Mike and I joined a tour with two other Aussies and twenty Yanks. We rode through the streets of Paris with all its crazy traffic, while our American guide Ned yelled “Dominate the street, show no fear” … easily said when you’ve been here for years, and are used to riding on cobbled streets. We took the two storey-train with our bikes, not an easy feat, to Versailles, where we were given time to wander the markets to shop for our picnic lunch. 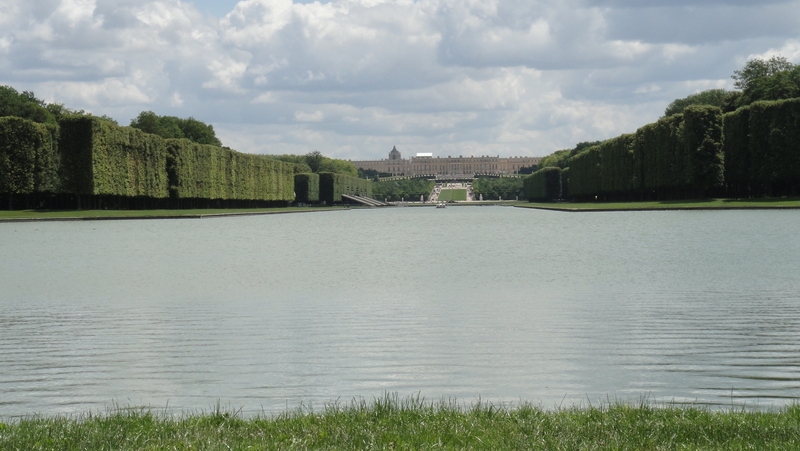 Then back on to the saddle for a tour of the vast parks and mini-palaces (not very mini in my opinion) to finish on the lawns overlooking the Grand Canal and up to the Palace of Versailles. Louis XIV had this massive canal built (several kilometres long) so he could have boating parties and recreate naval battles. Bizarre really, since the French had a knack for losing their naval battles. After touring the palace and its gardens, follies, fountains, etc, it’s not surprising really that the Bourgeoisie all lost their heads to the guillotine. Some things we did learn from our very animated guide Ned. Champagne was made popular by King Louis, as well as seasonal fashion, celebrity hairdressers, outlandish accessories (Maria Antoinette had sheep dyed in pastel colours to match her dress of the day), late night parties, actually parties after dark (Paris was the first city with street lighting) and how to be truly indulgent. So now we sit waiting after our final dinner in our neighborhood wine bar for our addition (bill), watching the Parisians stroll by being fashionable, smoking, greeting each other with the double cheek kisses, parking ridiculously small cars in even more ridiculously sized parking spots (bumper bars really live up to their name here), and here comes a man dressed in a suit on a unicycle on his mobile. But it’s adieu mon ami. 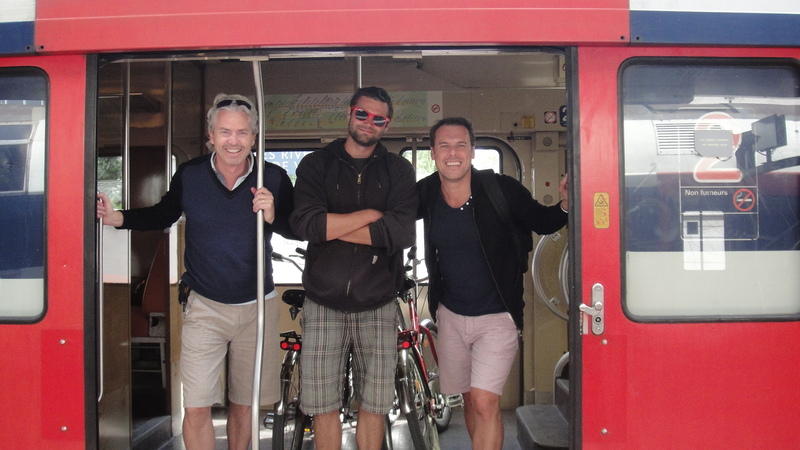 This entry was posted in France and tagged Fat Bike Tours Paris, France, Ned, Versailles. Bookmark the permalink.